Wisconsin is home to some 479 bird species, according to Avibase. Finches are members of the Fringillidae family of the passeriformes order. At least half of known bird species are passeriformes. The term refers to the fact that these birds have a foot structured for perching, use complex vocalization or sing. Members of the finch family are prized by many bird lovers for their song. Four species live in Winconsin. 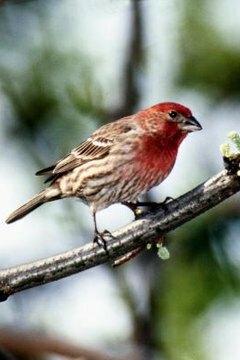 The house finch now lives in just about every part of the United States, plus southern Canada and parts of Mexico. It was introduced into eastern North America from the southwest in the 1940s, and adapted to more easterly life by taking up residence in urban residential areas. Out west, this finch prefers the suburbs, desert, orchard and chaparral habitats. The female is brown-streaked all over, but the male's head, throat and rump are typically in the pink-yellow-orange color spectrum. This species is primarily a seed eater, although they do eat the occasional insect and piece of fruit. The purple finch heads south for winter to the U.S.-Mexico border. The male of this medium-sized finch has a colorful rose-red body that gives him a purplish appearance. His wings and tail are brown. The female is entirely brown-streaked with no purple color. This finch prefers a mixed and coniferous woods, but also likes ornamental conifers in people's gardens. The purple finch's diet consists of caterpillars, insects, fruits and seeds. Outside of Wisconsin, the purple finch ranges over an area stretching from the Yukon in Canada to California and West Virginia. The male American goldfinch is predominantly bright yellow with a black cap and wings with flashes of white. Where the male is yellow, the female is a somewhat drabber olive-green and lacks the black cap. In winter the colors of both sexes are toned down, until they molt in spring. This is the only finch that molts in both spring and fall. The goldfinch is one of the noisier finches. The bird likes thicket, grassland and tree habitats. Goldfinches are found from Canada to the Carolinas, but in the winter, more are found in the southern states and Mexico. The gray-crowned rosy finch is a rare sight in Wisconsin, according to Avibase. Nevertheless, he does visit. His range is primarily in the west from Alaska to California and he prefers an alpine tundra and snowfields habitat. This bird has a brown body with pink on the belly, flanks and shoulders. The forehead is dark brown and in winter his beak turns yellow with a dark tip. The female is very similar in appearance to the male, but slightly less colorful. His diet consists of seeds and insects that he collects from the ground.